The Federal Board of Revenue (FBR) works semi-autonomously to audit, enforce and collect revenue on behalf of the government of Pakistan. It is considered to be the guardian of Pakistan’s treasury and has two main arms through which it operates, the Regional Tax Offices (RTOs) and Large Taxpayer Units (LTUs) with these units’ offices around the country. Recently, FBR launched its new website after revamping it. The website covers all the latest updates through a constantly moving news ticker and bringing the cursor to a news item would stop it to make it easily readable. Another section covers ‘Hot Topics’ like 2% sales tax for zero rated sectors. Sadly, the FBR is using TRIAL Version of Infragistics Web Components for its official website. NetAdvantage is a leading UI component provider for Desktop/Web based applications. This flaw is going to get the board a bad name and repute. On the website, there are five prominent sections on the site through which users can Apply for NTN, File Tax Return, Pay Taxes, Sales Tax Refund, and another section covering Import/Export. 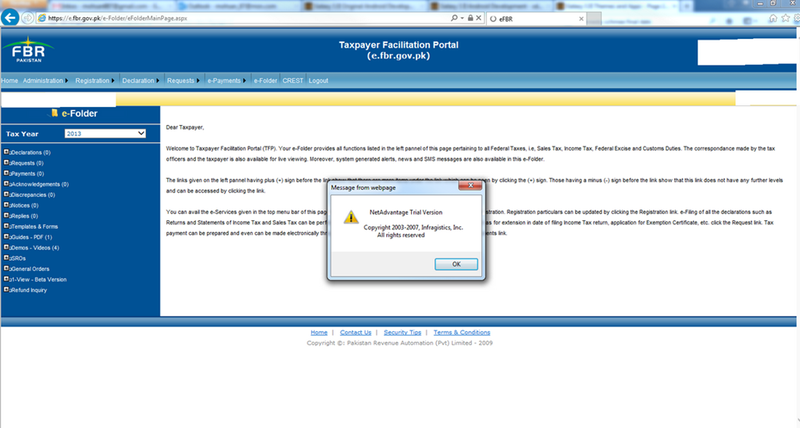 FBR now has a separate portal for taxpayers’ facility. The taxpayer facility online is the brainchild of FBR’s Chairman, Ali Arshad Hakeem. The portal will guide taxpayers in according with international practices. The portal is also user-friendly, since not every taxpaying citizen in Pakistan is web-equipped in skills. All the links of online services provided by FBR can be accessed through this portal in an easily visible section. All necessary information and guidelines regarding duties and taxes applicable to vehicles were also recently updated on the FBR’s new website. The new website also has a separate section for online forms for Registration, Sales Tax, and Income Tax. There is also a section for e-services like Online Taxpayer Registration and to make inquiry for NTN online. Users can also get their online ID, password and PIN. There are two lists which names active taxpayers and the dreaded black listed taxpayers. One of the primary reasons for Pakistan’s economic burdens is lack of taxpayers. Despite 9 million people who are registered for taxation, only around 0.9 million people amongst the country’s 190 million population pays taxes. The majority of the population is said to be not paying even a single rupee. But, there are law-abiding citizens who do file tax returns on time, albeit in the minority. For those users who were more comfortable with the earlier layout, the old version of the website is still available. As before, FBR is again asking for feedback on user experience on its website and suggestions on how to improve for the future. The feedback can also be given through FBR’s Facebook page. One thing is for sure that FBR did an effort to make website appear vibrant with all the different colours on the main page and it is not disappointing. Although, the way it is performing, it seems like there is still some tweaking at the back going on to make the website run smoothly. At one point during our review, it went offline, despite being “officially” launched, which does not sound surprising knowing that how these government agencies sites are maintained. I have been filing tax returns for 5 years now, using the e-filing facility for ~3 years now and have seen this message countless times over the ~3 years. This is not the new/cross browser compatible website they talk on the home page. This news is 3+ years late. I think their web developers are too dump, they should at least have searched for a crack rather than uploading timetrial components. I know its unethical but hey we are in Pakistan. one thing is good in the new website that it is multi browser compatible also the new design of the website is easy understandable.